As ornithologists, we frequently find ourselves engaged in avian field research in remote or challenging locations. We find ourselves in beautiful systems intently observing and monitoring species. We find ourselves recreationally in mountains and woodlands and on beaches. We find ourselves beyond the ‘golden hour’, described as the critical first hour after an injury or illness occurs (Hubbell, 2014). I am a field biologist and recent master’s graduate who has worked and travelled in a variety of habitats both in the United States and internationally. I have had the incredible fortune to work on great field research crews where we dedicate hours outside together. These experiences encouraged my career into ecology and conservation. In recent years, I have been responsible for seasonal technicians and school groups resulting in an increased awareness of potential vulnerability while working outside. A few years ago on a hot beach in New York I experienced a technician suffer from heat exhaustion following a long day of surveying. I knew something was up because it was the first time she was willing to hand over her SLR camera! Thankfully, some cadet force training and previous first aid experience prepared me for this. However, for most of us, basic first aid and CPR training are typically the highest level or most accessible training we receive. Often these classes, although valid and informative in their own right, are not entirely applicable nor relevant to our unique work situations. In most cases, we won’t have an AED close to hand or even phone reception allowing us to make the important emergency call. In 2018, I decided to enroll in the Wilderness First Aid course with MEDIC SOLO Wilderness Medicine to feel more prepared to assist those around me. The weekend long, entry-level first aid course was packed with pertinent medical theory and practical training. The course set up allowed us to practice the skills we were learning such as building leg splints or safely rolling or moving someone. The instructor, Matt Rosefsky, considered our wants and needs focusing on areas that would be most useful to the group. There were people from all backgrounds enrolled in the course; from youth group leaders responsible for young children, outdoor instructors and guides, outdoor enthusiasts and researchers like myself. Broadly, we learned about making a safe and thorough assessment, how to treat musculoskeletal injuries, soft tissue damage, environmental emergencies, and internal medical emergencies. Later this year I hope to take a more extensive qualification, the Wilderness First Responder course. 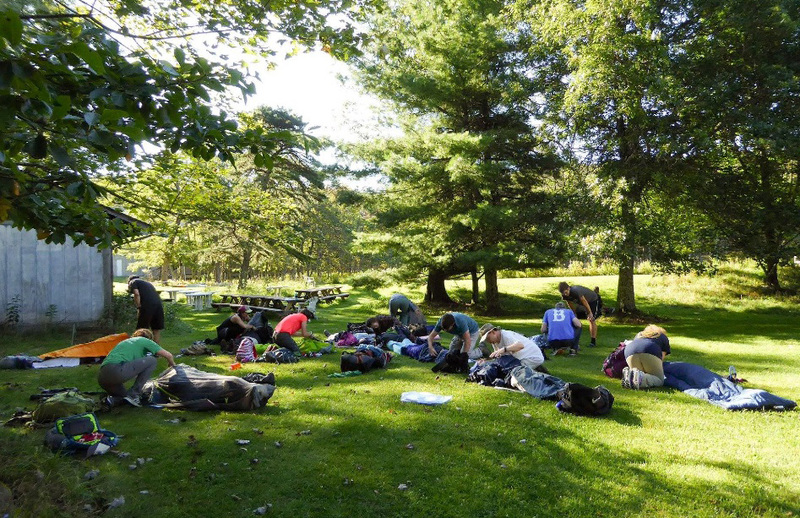 Although perhaps not necessary for everyone, I believe partaking in this outdoor specific first aid training increased my confidence and preparation while working outside and having responsibility for others’ safety. I highly recommend considering if you feel prepared for situations that may arise (although hopefully not!) while you are outside the ‘golden hour’, or if you simply have an interest in learning more about wilderness medicine. If you are interested in learning more check out the SOLO Wilderness Medicine website (https://soloschools.com/) or please reach out to me via email. Hubbell, Frank DO. 2014. SOLO’s Field Guide to Wilderness First Aid; Wilderness, Marine, Rural, Disaster, International. “Beyond the Golden Hour”. Third Edition. TMC Books/Stonehearth Open Learning Opportunities, Conway NH, USA. LINK.